I know, I know, I&apos;ve been slack, I have not been posting recently and I have no excuses either. A quick update and summary of what we&apos;ve been up to and where since the last blog. Roy had a checkup appointment with the cardiologist in Auckland a few weeks ago so we headed down from Uretiti and stayed with Steve & Les for the night. Roy got the all clear from the cardiologist, so much so that he has taken him off cholesterol tablets as he says "your arteries are clear, valves good and heart is strong so why are you on cholesterol tablets?". Apart from the Atrial Fibrillation which is now under control, all is well. We returned to the van at Uretiti, staying another few days before heading north. Next stop was Kerikeri where we managed a quick catch up with Roy&apos;s second cousin Stuart. We had a lovely dinner out in Kerikeri at the Jerusalem Cafe with Stuart where we shared a lovely Meze platter of Israeli food, and delicious it was too and the company, as always, was very good. 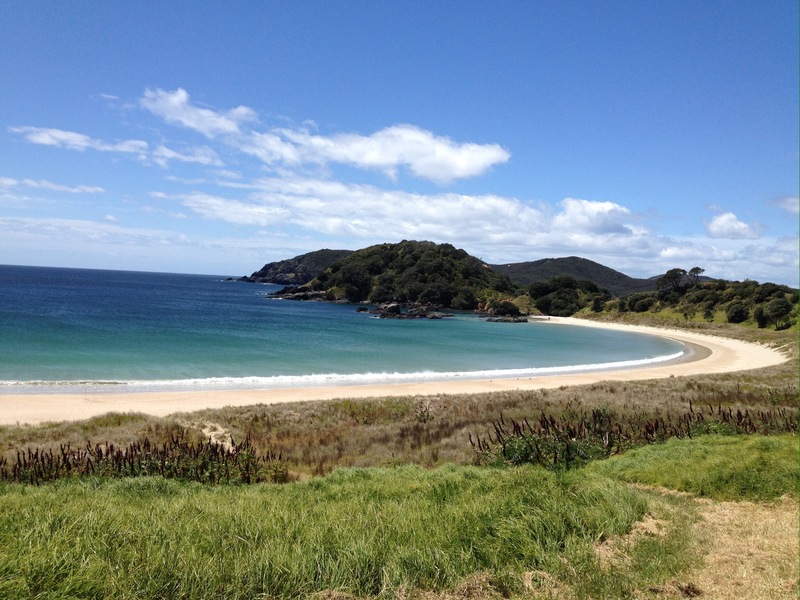 From there we headed up to Tokerau Beach, a particular favourite spot of ours, and where we have been for the past week camped on friends Gary & Marg&apos;s spare section behind their house. Here we have not only enjoyed their company, but we have shared meals, the odd drink or two, been out fishing a couple of times – the catching has been a different matter though with only a couple of fish landed – and generally having a very relaxing time. We only have another week left before we take up our house sitting duties at Whakapirau for a month which will then lead nicely into our upcoming &apos;holiday&apos;. Speaking of which we have finally sorted our upcoming trip and we are all booked and ready to go. We leave NZ on 27th September for London via Singapore with just a few hours stopover. We then leave London on the 17th January, this time with a three day stopover in Singapore on the journey home to arrive back in NZ on the 20th January at just before midnight. Other plans are still being formulated whilst we are away but we will be in Belgium for the 4th October Passchendaele commemoration, at some stage we will be heading to Switzerland and the Italian border to the town of Mendrisio which is where Roy&apos;s family is from originally. We then plan to meander our way back across France into Spain and Portugal. Somewhere in between we are fitting in a trip away with Alexandra & Ian, and Ian&apos;s parents, and it looks like we will be heading to the Canary Island of Lanzarote for a week of R&R in a villa on the coast. We shall be back in London ready for a white Christmas when Antony will be joining us all for the festive season. There will be tripping around the UK as well, catching up with a few of my relations and filling in the gaps on a few places we missed last time. All in all we shall be away for 4 months – I know, it&apos;s a tough job but someone has to do it! So there we have it, a quick catch up. I didn’t think it would ever happen, but it has. I have had enough fish for a while!!! 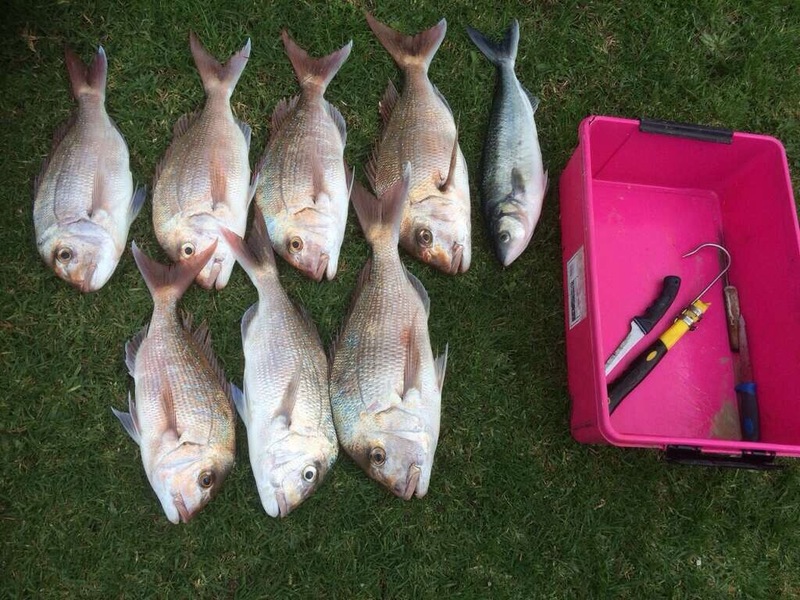 Last week was one of those weeks, we were hoping to get out and catch a couple of fish and it certainly started off well as last Monday we caught 8 good snapper when we went out with with Gary & Marg. 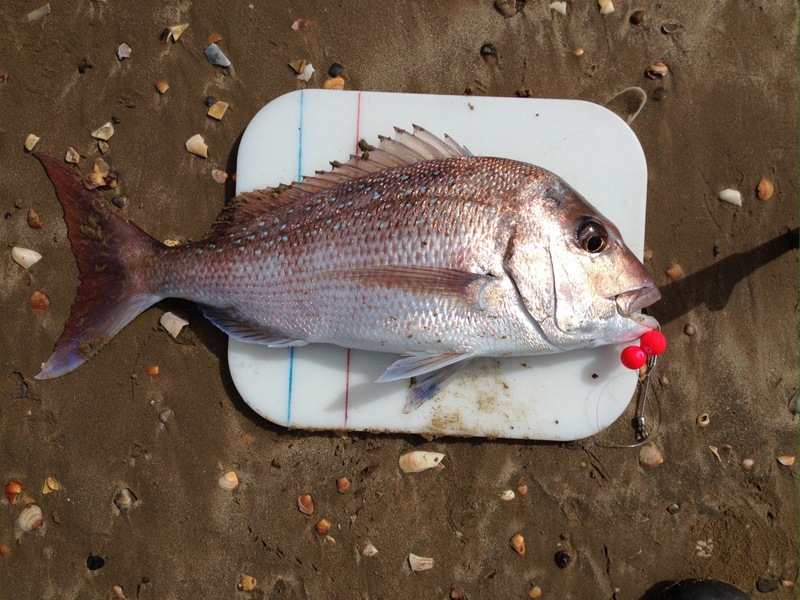 Then on Wednesday we went out for a fish off a Tokerau Beach with Pat & Sue. The wind was proving to be a little fickle which made putting out our lines a bit difficult as the kite stalled getting the line out through the breakers, then it only went out very slowly to end up only half the distance off shore that we were looking for, never mind. Meanwhile Pat & Sue had put up their big kite and got their line out to a reasonable distance, ending up about 1.2km off shore. 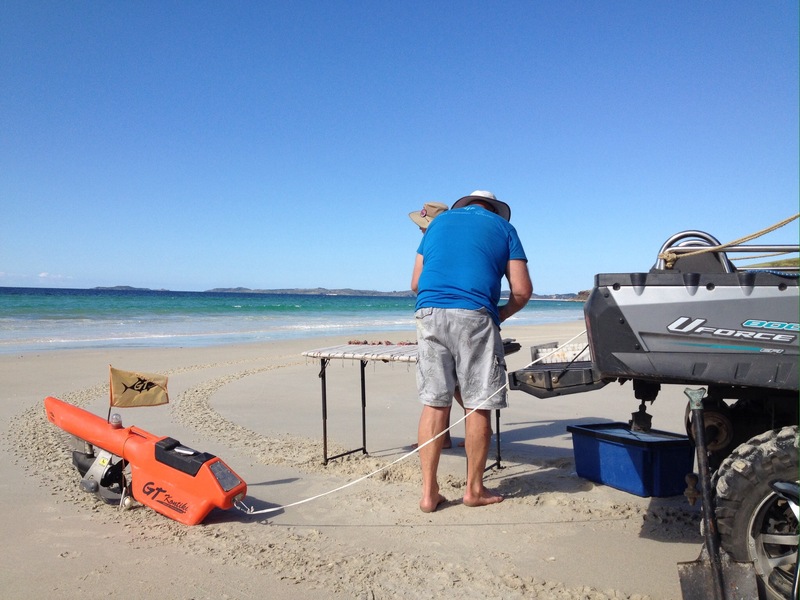 Now when we fish off the beach with Pat & Sue (some distance apart from each other so that the lines do not tangle), we have a set little routine of helping each other bring the lines back in. We brought our line in first as we thought that there would not be anything on the line as we were not too far offshore. The routine is that I wind the handle on the reel whilst the three others take turns in taking hold of the the line and walking it up the beach toward the reel. 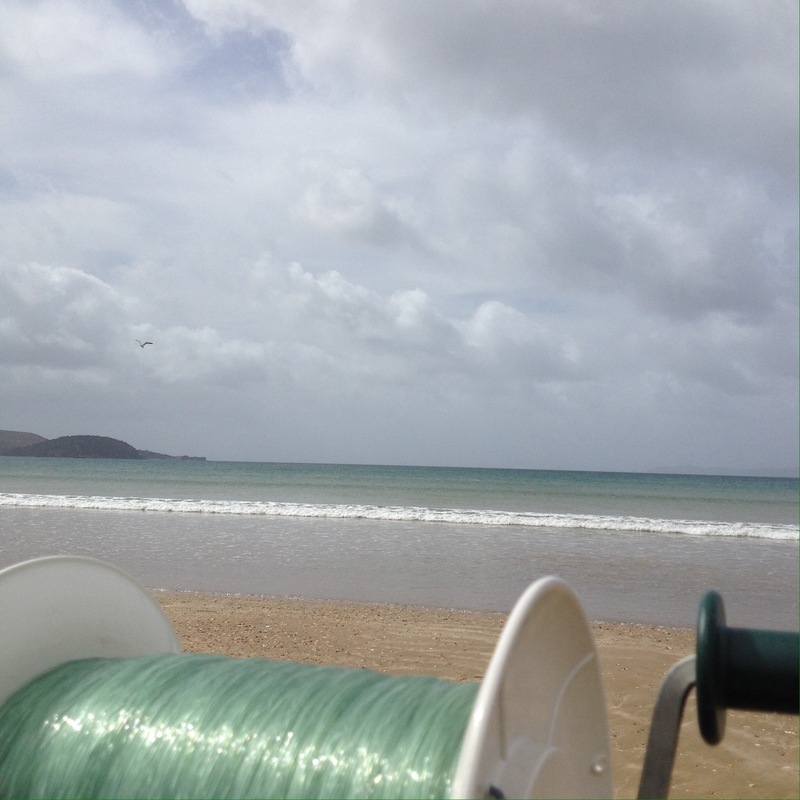 We do this as if we didn’t, the pressure on the reel would be too much by winding it in directly, as well as being far too difficult for the winder, so one by one, they grab the line with glove protected hands and walk it up the beach whilst I reel in the slack line. With three people walking the line in it doesn’t take too long so long as the wind is not too strong or a lot of weight on the line. We did have one good sized fish on our line so we were happy, so we quickly tidied up all our gear, put it into the car before it was our turn to go and help Pat & Sue. The only difference being that Sue winds in their reel and I take my turn walking up and down the beach along with the blokes. 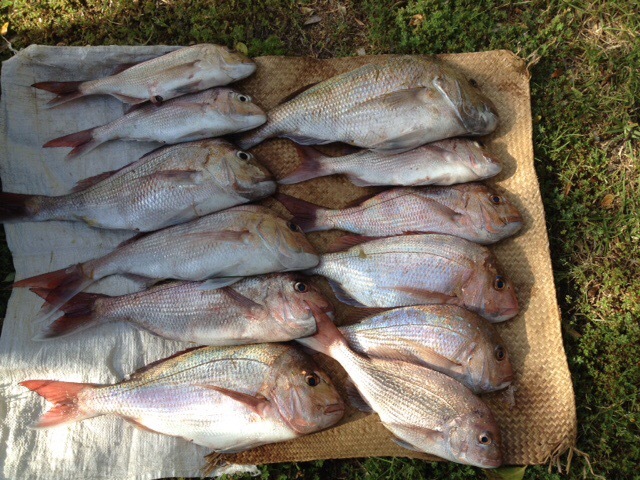 We were thrilled to see that on their line they had 7 good sized snapper and a gurnard, a fantastic result and their best catch to boot. 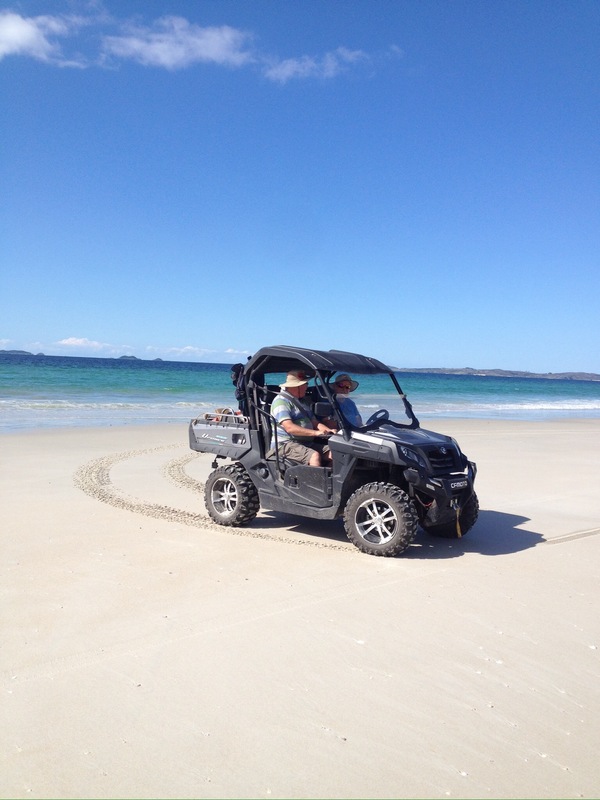 It was then back to base at Matai Bay, clean up and leave the fish on ice overnight ready to fillet the next morning. Roy and I were heading away on Friday to a get together of a special group of friends but more on that in a later post – and we were keen to take some fresh fish with us to share. 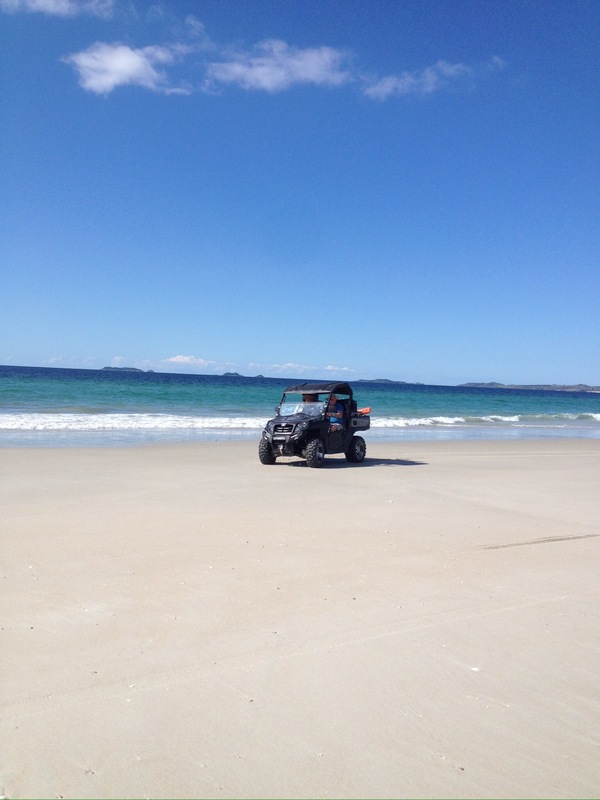 So on Thursday afternoon , the four of us headed out again to Tokerau Beach to try our luck. We each sent out our lines, this time in a good strong off shore wind, and then we sat back to wait for the fish to jump on our hooks – yeah, right!!! This time, Pat & Sue brought their line in first so we went off to assist. 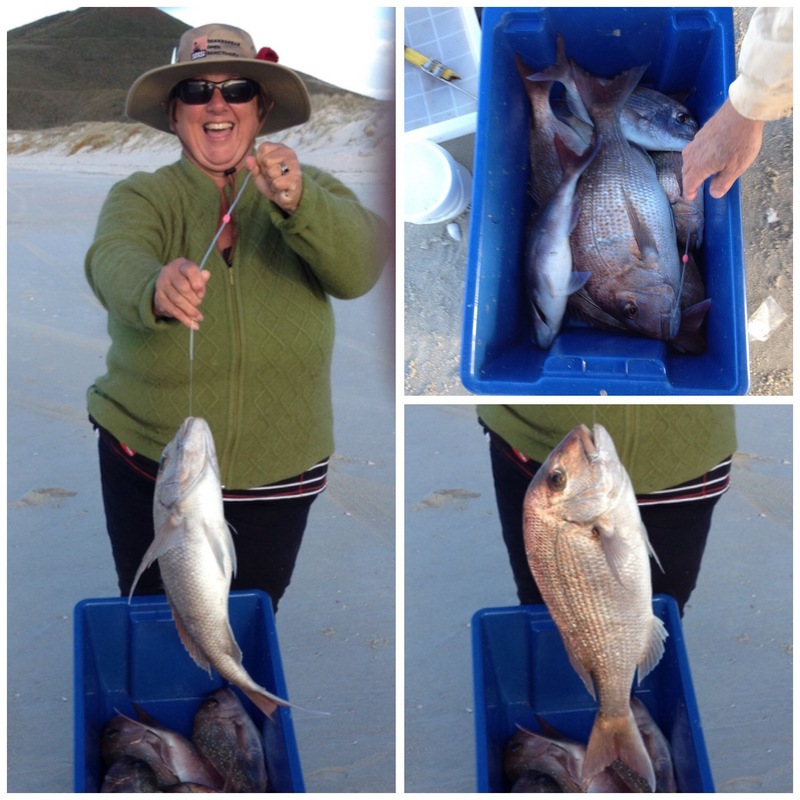 The wind was still very strong so it was a good trek up the beach with a very strong pull on the line, it was rather strenuous exercise but all the more pleasing when we pulled in three good fish on their line. Then it was back to our line to pull in our fish, well, we hoped there would be fish. It was damned hard work dragging in our line, with each of us saying that we hoped there was at least a couple of fish on the hooks as it was the hardest pull-in we have ever had. Meanwhile it was back to getting all the fish safely off hooks and into the chilly bin loaded with salt ice, putting away all our gear and heading back to Matai Bay. All a good size (all over 40cm) with the largest one was over 5kgs. We think that there may have been another three on the line as three traces had broken and with the tangled mess of lines we had it was more than possible. So what did we do with all this fish? Well, that’s another blog entry. 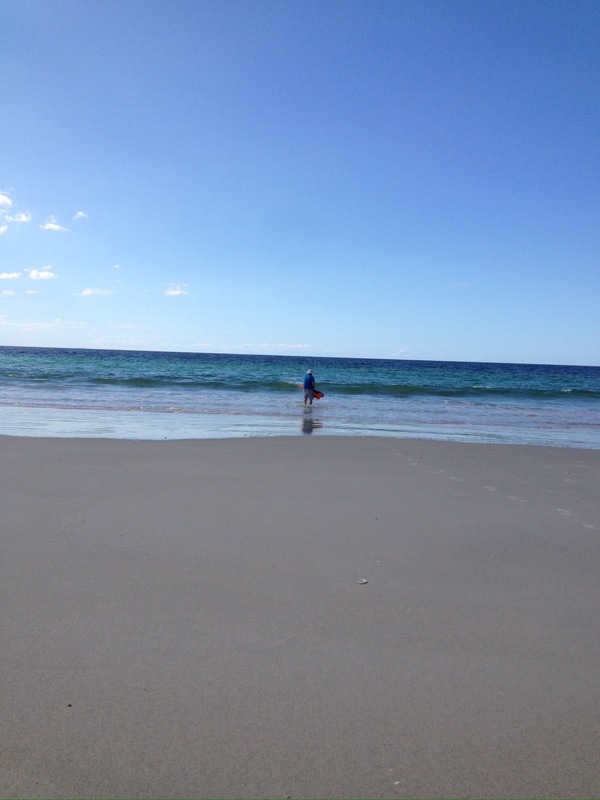 We are back at glorious Matai Bay. 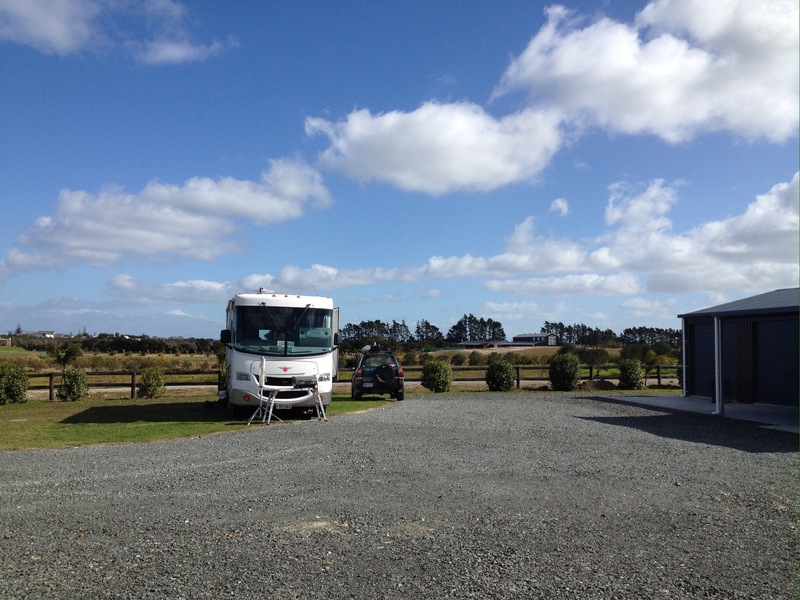 After spending a few days in Kaitaia last week to have some scheduled maintenance done on the van, we escaped back to the coast, although we are now awaiting some more parts to come in from the USA to complete the R&M. So in between, time for a bit more fishing. Then it’s just a matter of waiting for an hour or so before bringing it back in , plenty of time to tell tales, have a drink and a few nibbles before bringing the line back in to reveal these 8 beauties. I made a delicious ceviche with a few of the fillets to share with Pat & Sue and Craig & Glennis whilst we watched the Melbourne Cup the following afternoon. Hopefully we will get more fish to share with friends this weekend but that’s another story. 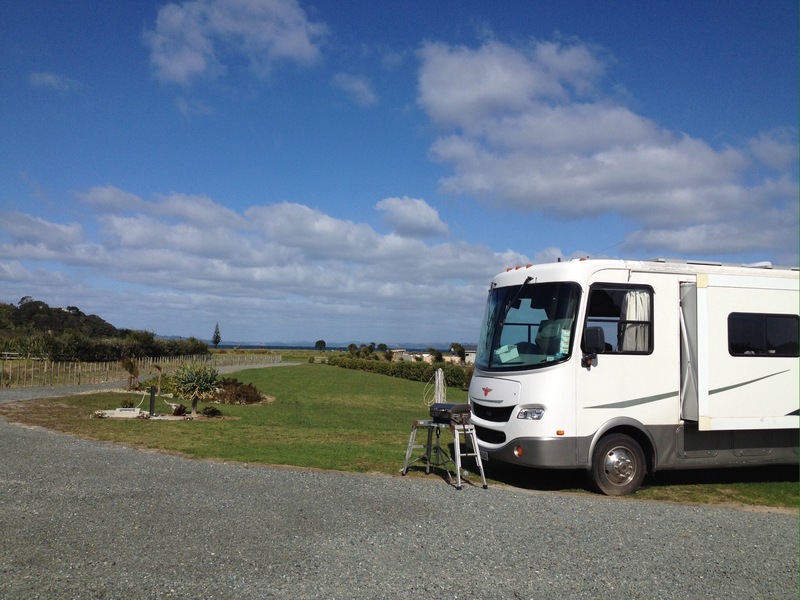 We have been at a PoP (Park over Property for NZMCA Members) at Tokerau Beach for just over a week now, enjoying the lovely surrounds and friendly hosts as well as the close proximity to good beaches, perfect for fishing and relaxing. Our parking position on the property looking down toward beach. 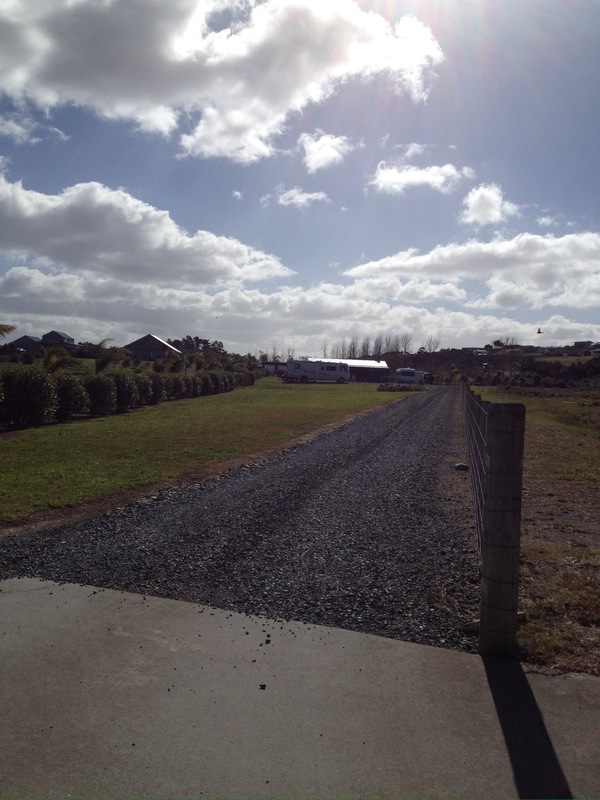 Looking onto the site from the gate. Sue enough after an hour or so, we pulled the line in, but it wasn’t looking too good, as hook after hook came back empty, until the very last hook which had a fish on it. I wandered down to the waters edge to check and see if it was a keeper or had to be released, I was delighted to see it was of a reasonable size, but I did get our board outto measure it on just to make sure. 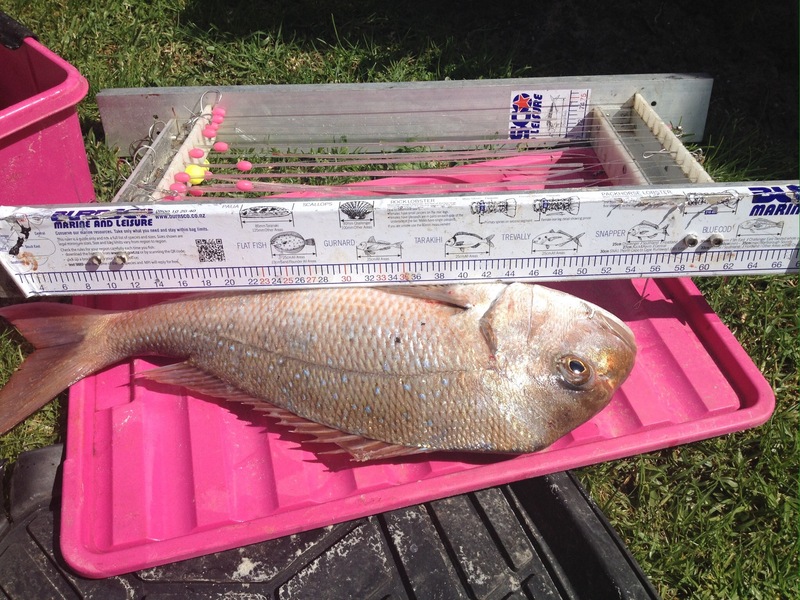 The blue line on the board is the 30cm mark for snapper…..yes, I think it passes the mark! That will be perfect for dinner plus enough for a fillet to put into the freezer for another day. Yep, I think it’s big enough. After filleting them all and each taking our portions, we also took the cheeks/wings to smoke for some lovely smoked fish. A great couple of days fishing, or should I say catching, and now that the strong winds have finally subsided we can hopefully look forward to catching more fish this week.